Looking for a tool to stop your players from massacring and committing suicide on your server? Tired of all those annoying hostile mobs? Your plugin doesn't protect from forge mods' damage? Then this mod certainly deserves your attention. 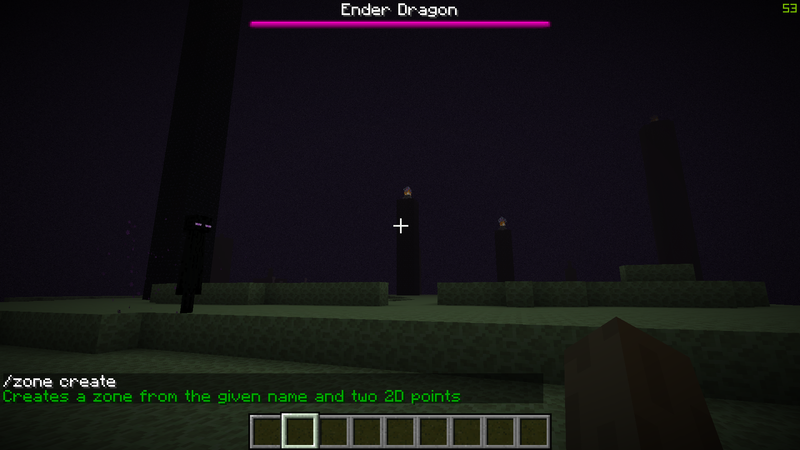 This mod adds an easy way to protect players in a certain areas of your server. It doesn't require your players to install the mod as well. Client doesn't require the mod to be installed. All of the commands start with one base command: "/zone". Remember that the 'Tab' key can be used to complete most of the commands' arguments. The mod's commands are only available to level 4 operators and cannot be ran by command blocks. Zones are not shared across worlds (dimensions). If you're hosting on a server remember that the client does not require the mod, however the client will not see translated command chat responses and will instead receive untranslated unlocalized codenames. 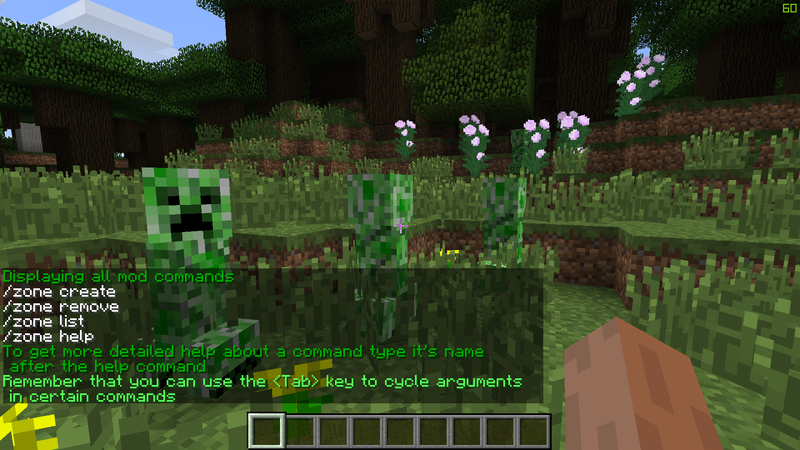 To get information about all the commands in the mod type "/zone help". To get information about a certain command type "/zone help" followed by the command's name. A zone is defined by a name and two sets of two-dimensional coordinates over the X and Z axes. Keep in mind that zones can have identical coordinates, but not identical names. To create a zone type "/zone create" followed by it's name and coordinates. Don't forget that you can use relative coordinates (tilde "~") when creating zones. Zones are identified only by name. To remove a zone type "/zone clear" followed by it's name. You can also remove all existing zones in the current dimension by typing "/zone clear". You can see all existing zones and their information in the current dimension sorted in alphabetical order by typing "/zone list". Also, you can see information about a specific zone by name by typing type "/zone list" followed by the zone's name. I don't have many features in mind, but I'm always open to suggestions. Updated to 1.10.2 and 1.11.2. It should be up once the files are reviewed over at curse. I would love if you could add anti-grief for 1.7.10. 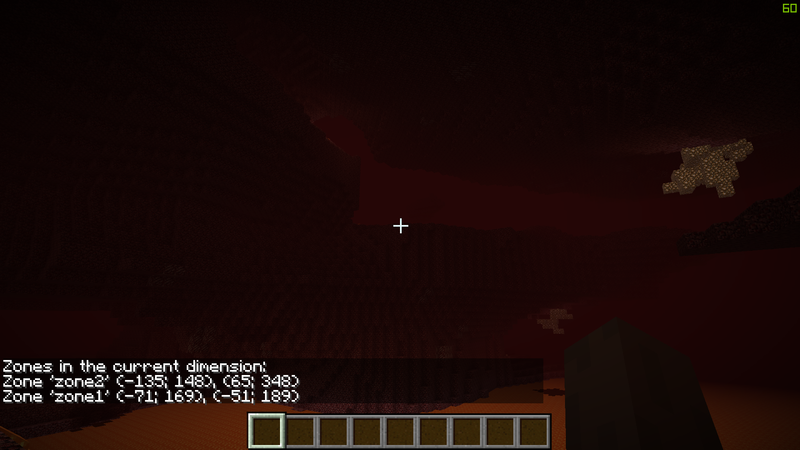 I am making a server that needs a mod that works like WorldGuard, and ForgeEssentials is glitchy as heck. I might include that feature. But I'm quite busy with other things including other mods and it might be quite a while until I get back to this one.